Discover a great selection of David Beckham deodorants with captivating and irresistible scents that truly capture the elegance, style and modern masculinity synonymous with the icon, 'David Beckham' himself. Sporty and refreshing these deodorant body sprays keep you smelling fresh and active all day long. 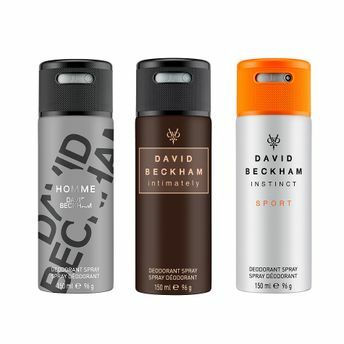 David Beckham Instinct Sport Deodorant Body Spray(150ml)-A burst of tangy orange, juicy mandarin and sparkling ginger open this invigorating fragrance. An energetic heart of fresh violet leaves, crisp green apple and dynamic aromatic notes convey masculinity while a smooth and deep dry down of creamy sandalwood, earthy woods and enveloping cashmeran end the fragrance with a signature Beckham sophistication. David Beckham Intimately Deodorant Body Spray (150ml)-Top notes are blood orange, amalfi lemon and green notes; middle notes are lavender, sage and basil; base notes are vetyver, sandalwood and tonka bean. David Beckham Homme Deodorant Body Spray (150ml)-Top notes of this excellent composition offer citrusy zest skillfully mixed with ginger and Szechuan pepper. A heart introduces cashmere, leather and rosemary, while a base leaves a trail of mahogany, patchouli and musk.